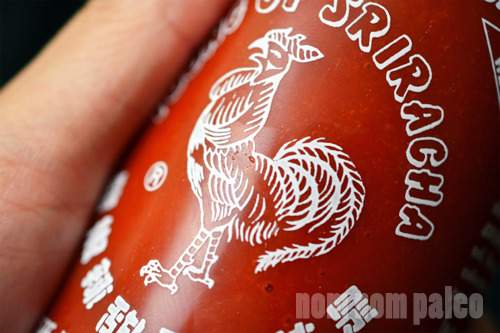 Question: Who doesn’t love sriracha? Answer: People who haven’t tried it yet. But I know you. You’re a sriracha connoisseur. The first time you spied it on the table at your favorite Vietnamese joint and squirted some onto your spoonful of phở, you were hooked. You squealed when you spotted little squeeze packets of sriracha at the food truck near your office. You sought out the rooster-emblazoned bottle with the green top at Asian supermarkets. You stockpiled the stuff in your pantry and ate the spicy, umami-packed condiment with, well, everything. You even got yourself a T-shirt with the Huy Fong Sriracha Sauce logo on it. Also? A matching iPhone case and tattoo. And why not? 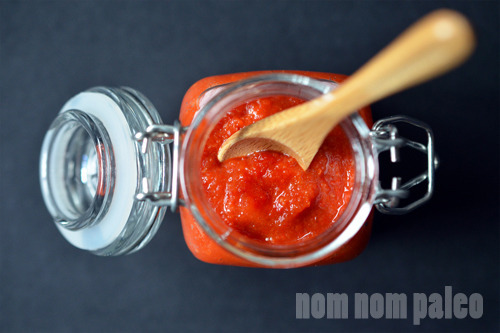 Sriracha’s been called The World’s Greatest Condiment and The Most Amazing Condiment on the Planet and “a delicious blessing flavored with the incandescent glow of a thousand dying suns” – and you know that’s no hyperbole. Sriracha is magic. But then you went Paleo. 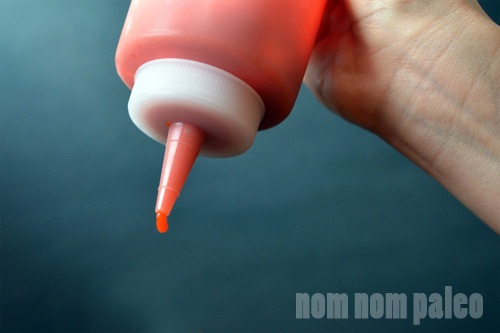 And for the first time, you read the ingredients on your store-bought squeeze bottle of sriracha. You saw that it contains stuff you don’t recognize, like potassium sorbate, sodium bisulfite, and xantham gum. And it felt like someone let all the air out of your balloon. Yeah, after some furious Googling, you found a detailed recipe on the Internet for D.I.Y. 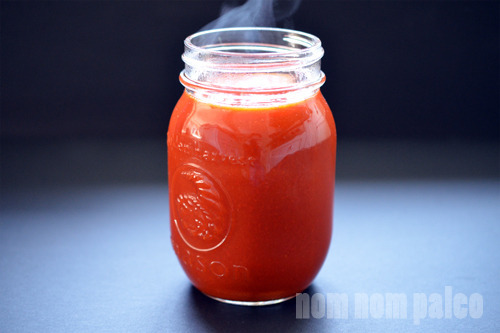 sriracha – but it calls for a week of fermentation and daily stirring. And sadly, patience isn’t one of your virtues. 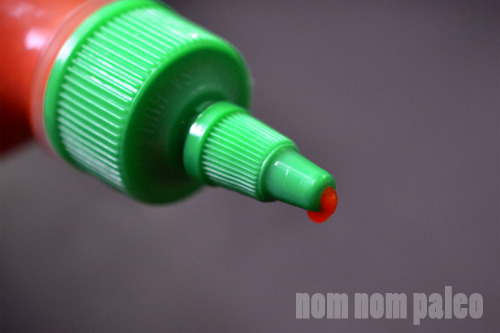 You want sriracha today. Sad face. I know how you feel. I felt the same way…until now. For a while, Henry and I have been testing and re-testing various ways to make a quick, real-ingredients-only version of the world-famous “Rooster Sauce.” There were plenty of challenges: Getting the right balance of spice, tang, and sweetness. Mastering the texture. Achieving a deep, rich, satisfying umami without a week of fermentation. Not rubbing capsaicin into our eyes. After a long shift at the hospital yesterday, I came home with a bag of fresh red jalapeños, and decided to stay up until the code was cracked. Henry and I rolled up our sleeves, and soon enough, we captured lightning in a (squeeze) bottle. 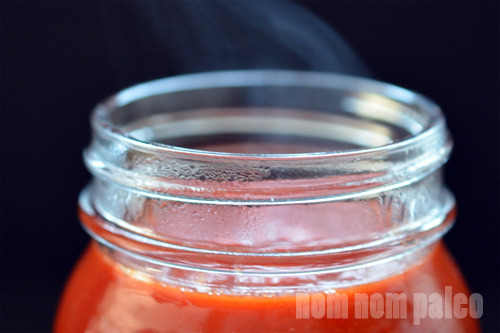 That’s right: In our hands is the Holy Grail of Condiments: Paleo Sriracha. Want the recipe? 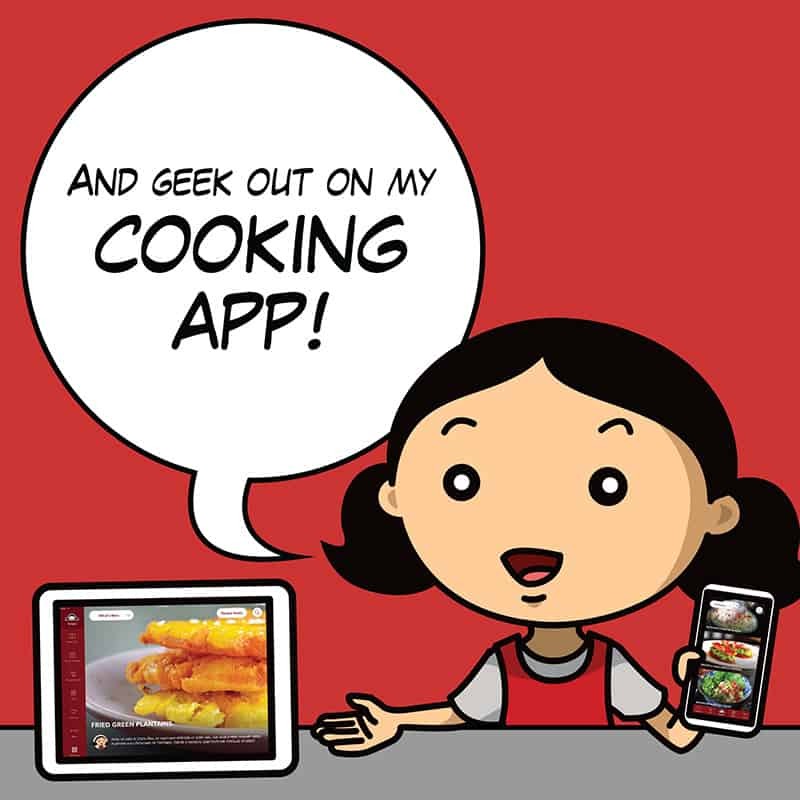 Well, I’ve decided to offer it only in my iPad cookbook app. 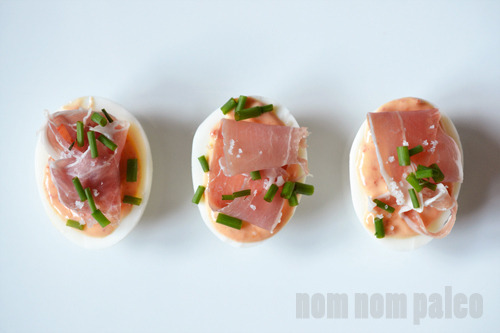 This recipe’ll take just 20 minutes of your time! 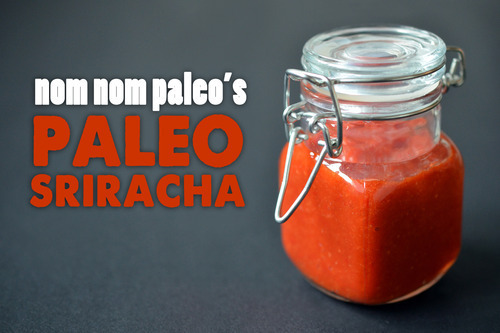 This sriracha ain’t just Paleo-friendly – it’s also super-fast. Huy Fong Sriracha is fermented to boost the umami in the fiery red sauce, but I found a way around the weeklong waiting period. 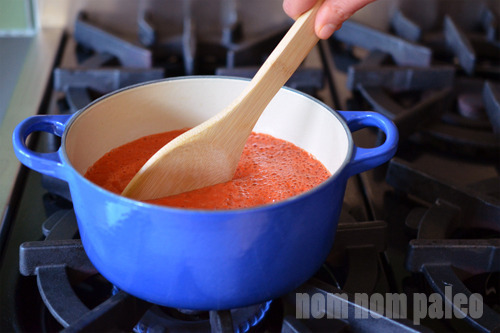 I simply added the umami myself, in the form of tomato paste and fish sauce. I’ve found that removing the seeds and most of the ribs from the jalapeno peppers produces a sauce of moderate heat, which is my personal preference. If you like to breathe fire and have a Teflon gastrointestinal tract (hello, Charles Mayfield), feel free to keep the ribs and seeds, and/or use hotter peppers (like serranos or even Lumbre peppers). Throw everything into a high-speed blender (like a Vitamix) or a turbocharged food processor. 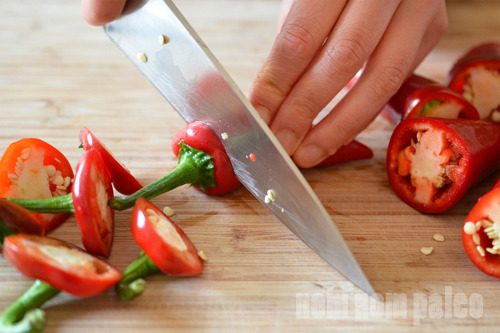 A regular food processor will also work – but you’ll want to cut the peppers and garlic into smaller pieces, and blitz the ingredients longer. Otherwise, your sauce may end up on the chunky side. We tested a batch using a weak little mini-prep, and the resulting sriracha was noticeably thicker (but still insanely flavorful). Don’t worry about the froth on top – it’ll cook off later. 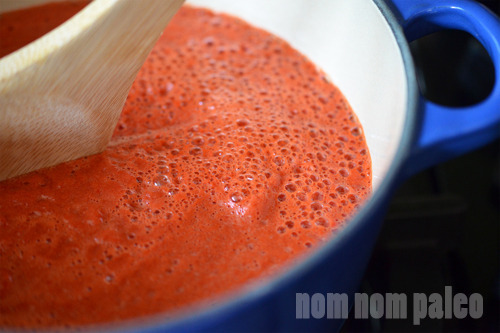 Pour the purée into a medium saucepan and bring to a boil over high heat. 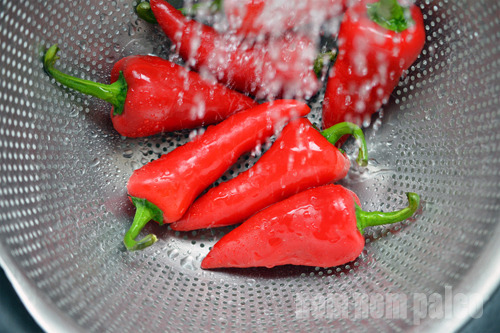 As soon as it boils, reduce the heat to low and maintain a simmer for 5 to 10 minutes, stirring occasionally. By cooking the sauce, we concentrate and deepen the flavors, and cut the sharpness of the raw garlic. 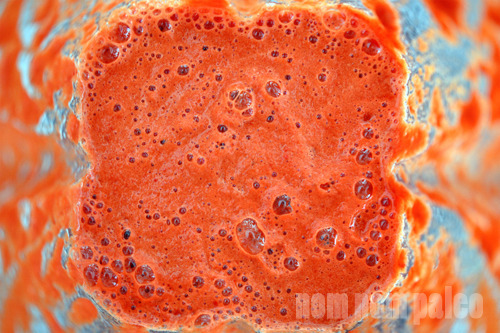 Once the foam subsides, the sauce should be a vibrant red color, and you shouldn’t be able to detect any raw vegetable smell. Taste and adjust for seasoning if necessary. 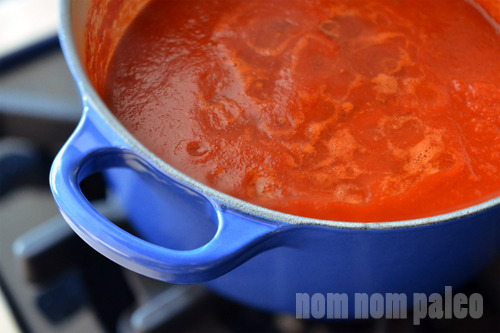 Check out my Periscope video that shows you how I make this sauce in my own kitchen! I like to keep some ready to go in squeeze bottles, too. You never know when you need a squirt of the stuff, am I right? Sriracha makes everything taste exponentially better – from eggs and burgers to Asian stir-fries and steaming bowls of phở (like the Paleo version in my iPad app!). It may be sacrilege to say this, but sriracha can even punch up your Thanksgiving turkey. Okay – your turn! 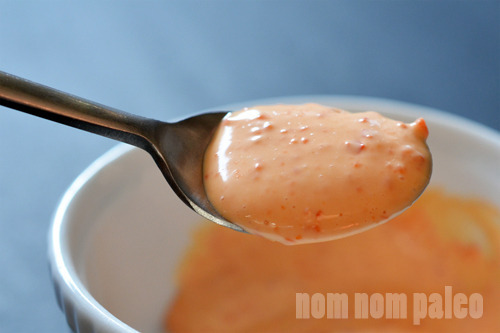 Give this recipe a try and let me know what you squirted it on, por favor! P.S. 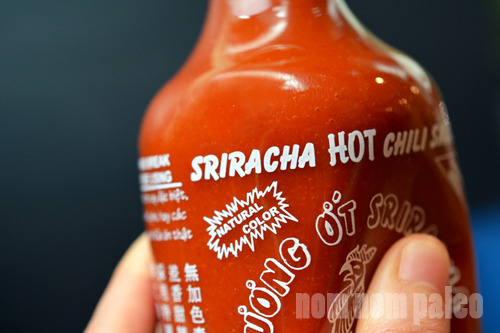 : This sriracha does contain a bit of honey – the mild sweetness is key to the sriracha-ness of sriracha, and trust me: subbing in dates and other fruit doesn’t produce the right flavor profile. 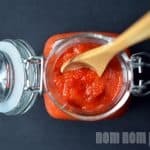 So if you’re doing a Whole30® or a 21 Day Sugar Detox, you’ll have to wait a little while longer before enjoying The World’s Greatest Condiment again. P.P.S. 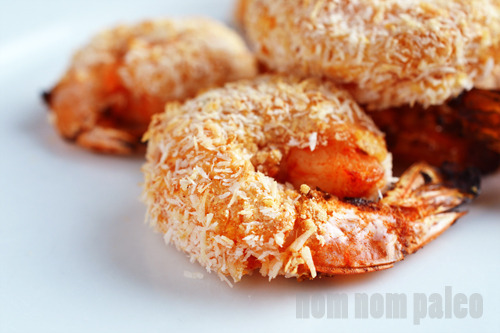 : Feel free to share a link to this recipe on Facebook, Twitter, Pinterest, Google+, Tumblr, or your own blog. I love it when people are excited about my food – that’s why I do this, after all! Just give attribution with a link back to Nom Nom Paleo, and please don’t out-and-out reprint (i.e., cut and paste) my recipe and photos without permission, okay? Thanks, peeps! P.P.P.S. : Hello, BuzzFeed readers! Welcome to my cave – and if you’re interested in learning more about the Paleo approach to eating, click here! 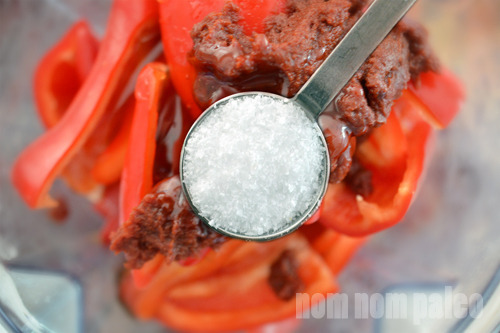 You can make this Paleo Sriracha in only 20 minutes! It's just as tasty as the stuff you buy at the store, but without the junk! 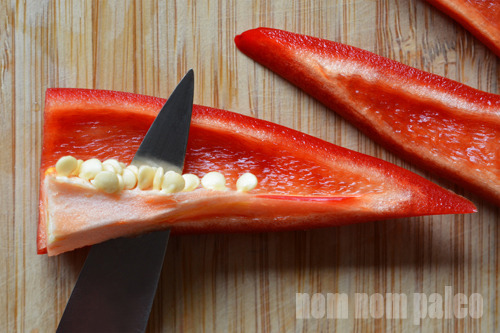 First, prep your peppers. I’ve found that removing the seeds and most of the ribs from the jalapeno peppers produces a sauce of moderate heat, which is my personal preference. If you like to breathe fire and have a Teflon gastrointestinal tract, feel free to keep the ribs and seeds, and/or use hotter peppers (like serranos or even Lumbre peppers). As soon as it boils, reduce the heat to low and maintain a simmer for 5 to 10 minutes, stirring occasionally. By cooking the sauce, we concentrate and deepen the flavors, and cut the sharpness of the raw garlic. 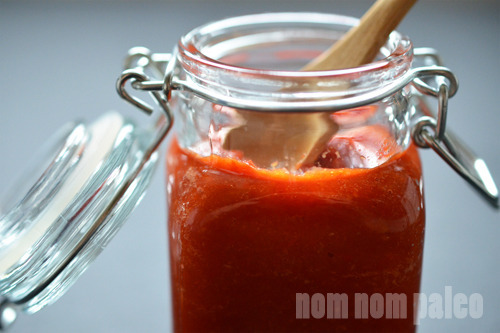 Transfer the sriracha to a jar (or three) and allow the sauce to cool. You can keep it in the fridge for up to a week. I love to freeze mine in these silicone ice cube trays because they’ll last for few months and I can pop a cube out whenever I need some spicy goodness. 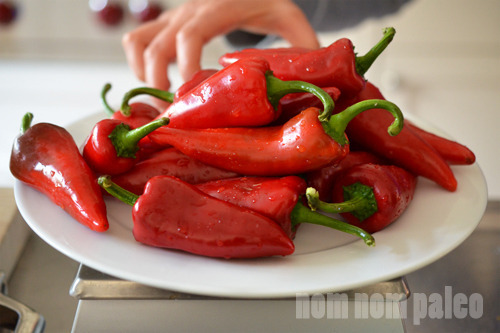 Pro tip: Use gloves when handling the peppers to avoid burning your hands and eyes. 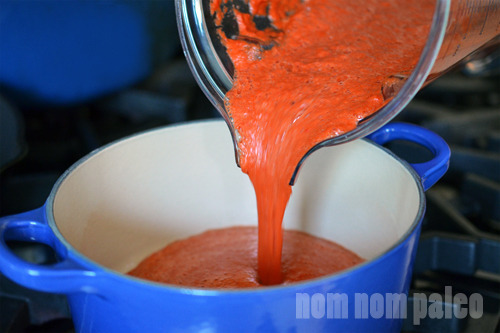 If you don't have a high speed blender or food processor, you can blend the sauce again after you cook it to make it smoother.